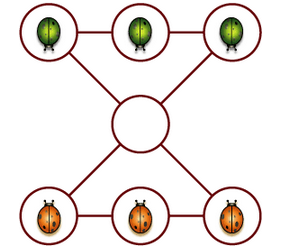 A bug may move from its spot along a line to an empty space as long as it doesn't pass over another bug. A bug that is in one of the corner spots may jump over another bug of a different colour provided it jumps in a straight line and lands in an empty space. A bug cannot jump over a bug of the same colour.